Vinette and John… all smiles. 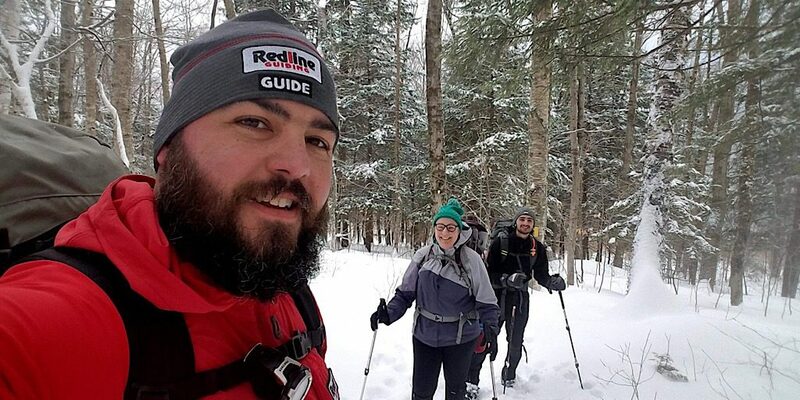 While we had a couple of guests skiing the north side of the Kancamaugus Highway on Nordic gear, Redline Guide Álvaro Marques was on the south side leading two more guests, a woman, Vinette, and her favorite outdoorsy nephew, John, on a snowshoe hike of the 2532-foot Hedgehog Moutain via the UNH Trail. 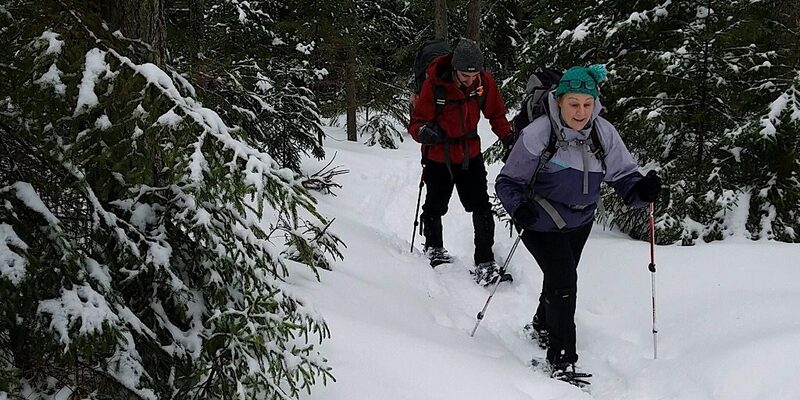 While Vinette has a fair amount of experience, John is new to winter hiking but took to snowshoeing right away. Álvaro reported that he was a natural. This was going to be fun. 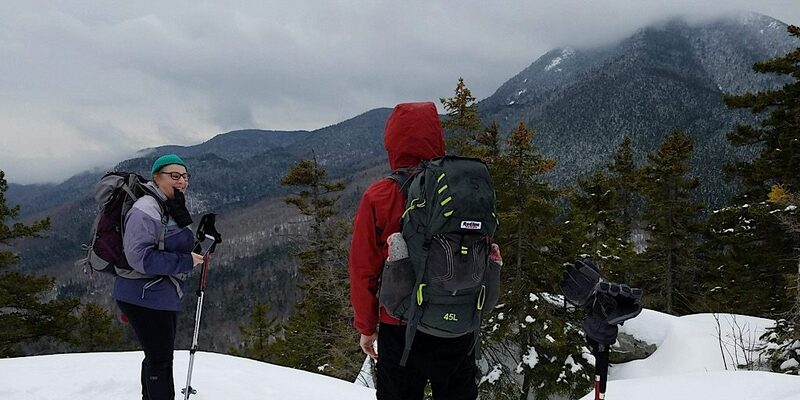 Thankfully our Ready Pack made it possible. 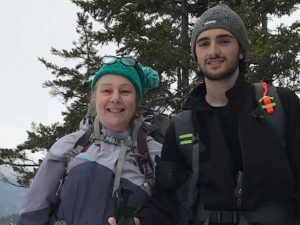 For those who don’t know it, this particular mountain boasts three major viewpoints and is on the state’s “52 With A View” list (fifty two view-worthy mountains under 4000-feet). 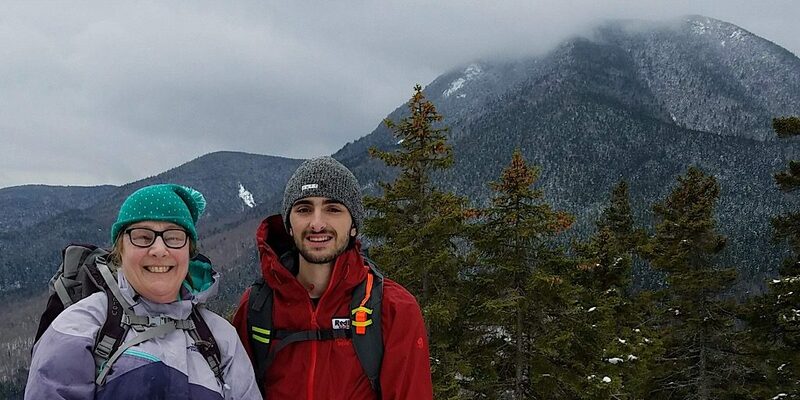 The UNH Trail is a lollipop-type loop hike starting from a 0.8 mile-long central trail before branching. Think of the “stick” of the lollipop. 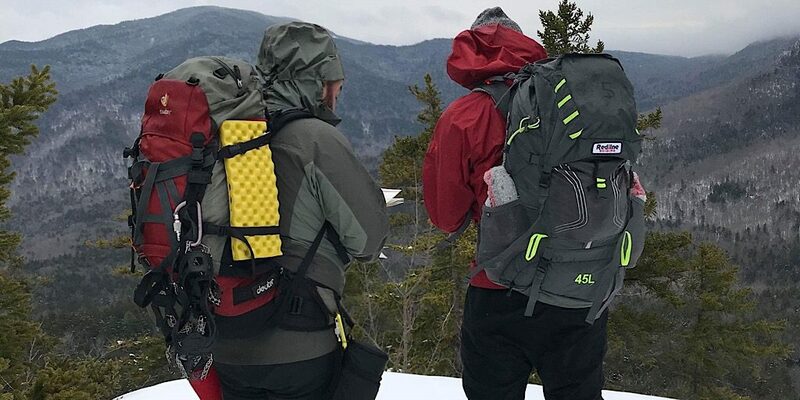 Our trio, after hiking to the start of the actual loop, decided as per their morning plan to go right hitting Allen’s Ledge and the summit first, before dropping down to the mountain-facing East Ledges. 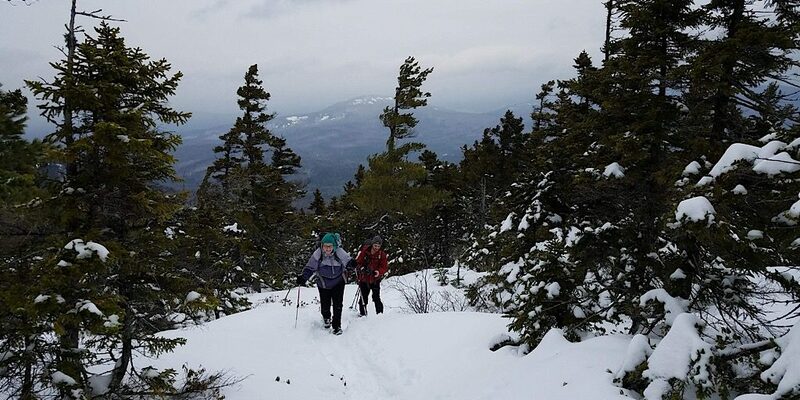 The trail was broken out so they enjoyed a relatively easy ascent. 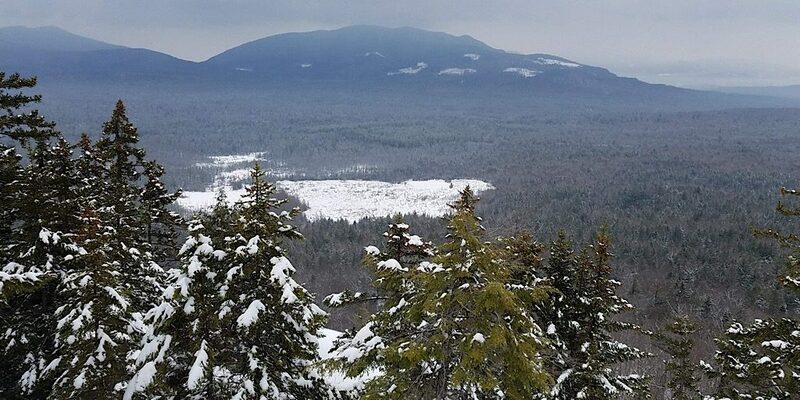 The view at the Allen’s Ledge was excellent, as was the summit view and later those from the East Ledges. All was going according to plan. After that, though, the idea of continuing around to complete the loop was dashed by the lack of broken trail. 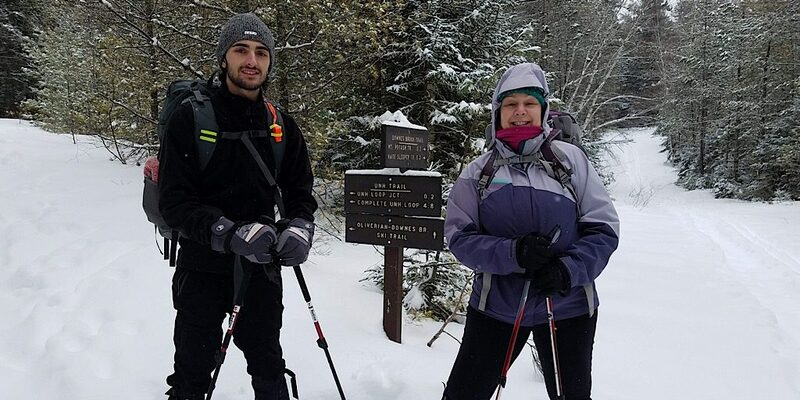 Álvaro and John were undaunted, and the trio did travel some ways in the knee deep snow (even with snowshoes), but ultimately the team decided to turn around and go back the way they came. At the trailhead, ready to hike. Hiking in. My, what dashing guide you have. The west view from Allen’s Ledge. Everyone having a good time? Check! Making progress. Such a lovely forest. Guide Álvaro with John. Note the “Ready Pack” as it made the trip possible. Photo by Vinette. That is Mt Passaconway in the background. All smiles! 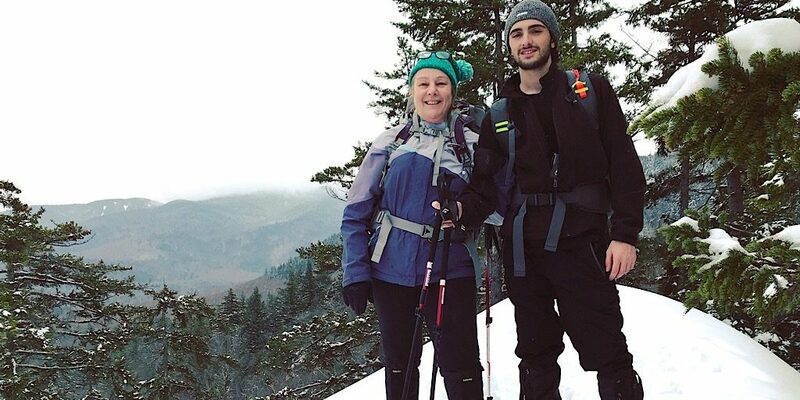 For those who have hiked with Álvaro or who’ve been following our adventures, you’ll know his claim to fame, so to speak, is sharing sometimes even cooking Portuguese comfort foods like chouriço (chorizo). 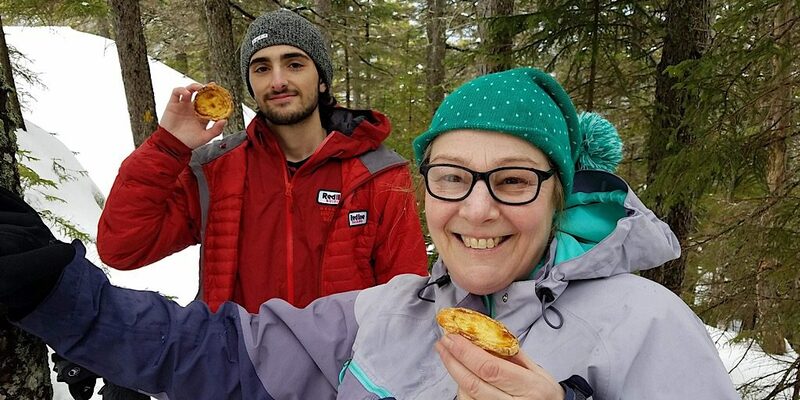 On this Hedgehog hike, Álvaro didn’t disappoint bringing along special tarts called pastéis de belém for them all to sample. 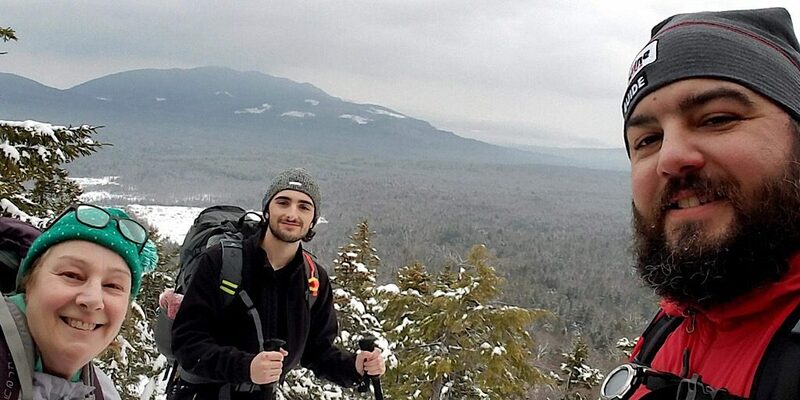 For your own delicious hike, click Book Now, then request Álvaro in the comments. Such a pretty mountain. Well done all. Tasty guiding, Álvaro!